The SDO.gsfc.nasa.gov website will be unavailable today from 7:00 am - noon ET while work on the electrical supply to the building takes place. 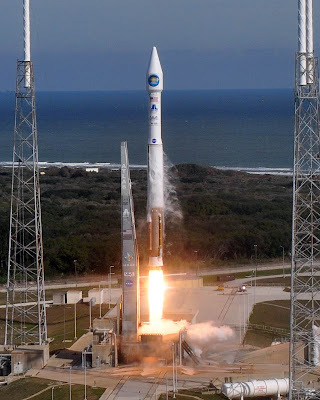 SDO will perform Station Keeping (or Delta-V) Maneuver #17 today between 2200-2250 UTC (6:00-6:50 p.m. ET). This maneuver is used to keep SDO inside its box in the geosynchronous belt. SDO thrusters will expel 82 grams of propellant to complete the maneuver. During the maneuver science data may be missing or blurry. Comet Offpoint Test Looked Great! The comet offpoint test SDO ran very smoothly yesterday. Here is an AIA 171 Å image from 1441 UTC (10:41 am ET). The image of the Sun has been shifted back to the middle of the frame so the offpoint doesn't look so jarring in the daily movies. If this had been a real comet observation the scientists would want to examine the missing right-hand side for the comet tail. AIA 171 Å was our best channel for looking at the comets. My thanks to the SDO Flight Operations Team for making the test look easy. Tomorrow morning, from 1430-1505 UTC (10:30-11:05 ET), SDO will perform a comet offprint test maneuver. This is only a test, there is no comet that will be visible. However, it has been almost 6 years since we performed such a maneuver and its good to keep in practice. We only get a day or two notice when a Kreutz sun-grazing comet might be visible. This test allows us to put the instructions in a easy to access location for the next comet. The Sun will appear to shift to the left during the test. That means it is useful for Kreutz comets in July and August, when the comets appear to come from the right and pass across the face of the Sun. Some science data, such as magnetograms and Dopplergrams, will not be produced while the Sun is shifted from the center of the images. When a sun-grazing comet arrives, we will be ready to go comet watching! Today at 1500 UTC (11:00 am ET) SDO will perform the HMI roll. The spacecraft rolls once around the axis pointed towards the Sun to provide calibration information for the instruments. These measurements are also used to learn how round the Sun is. Here are other planned maneuvers through the rest of 2018. The pair of Lunar Transits on September 9th and 10th are separated by approximately 4 hours 22 minutes, so they are considered separate events. However, the relative motion of SDO and the Moon cause what could be a single transit to split into two. We will discuss this more as we approach the transits. The sun and moon will be separated by 0.604° on August 21, 2018. (The Sun is 0.5° across, so the Moon is not in the field of view of the SDO images.) This is not close enough to be flagged as a transit, but the proximity may be of interest. Today SDO is performing the EVE Field of View and HMI Flatfield calibration maneuvers. Between 1315 and 1910 UTC (9:15 am - 3:10 pm ET) SDO will move in patterns about the Sun. Science data may be unavailable at these times or blurry. Here is an AIA 193 Å image from 1354 UTC with the bottom right corner of the Sun cutoff by SDO pointing away from the center of the Sun. The Royal Greenwich Observatory (RGO) dedicated a new telescope on June 25, 2018, returning a tradition of observations to London. The telescope is called the Annie Maunder Astrographic Telescope (AMAT), in honor of Annie Maunder, a famous solar and stellar astronomer who worked at RGO from 1891 until the 1930’s. The RGO is best known to solar scientists as the place where sunspot pictures were made from 1874 until 1976. Those photographs have been used by many scientists to understand how sunspots behave. Having photographs allows us to go back and remeasure the sunspot properties to see if something was missed. Annie Maunder studied the Sun at RGO. She worked with her husband (E. Walter Maunder) for many years. After they were married she was unable to get paid for her work but continued her research into the Sun, sunspots, and whether the Sun affected our climate. Along the way, she helped develop the Butterfly Diagram (1904 and 1922), wrote a popular book on the Sun (1908), and examined the Maunder Minimum, the period from 1645 to 1715 when few sunspots were seen and the climate in England was colder than average (1894). She traveled to far-flung places and photographed solar eclipses, all at a time when women were not supposed to do such things. Her outstanding research led to her election as a fellow of the Royal Astronomical Society in 1916, the first female ever to be admitted to the Society. The original butterfly diagram appeared in the Monthly Notices of the Royal Astronomical Society in 1904 and again in the 1908 book The Heavens and Their Story. Here is the 1904 version, copied from the journal article. It is easy to see that sunspots follow a pattern. They start at higher latitudes at the beginning of the cycle and form at lower and lower latitudes as the sunspot cycle continues. 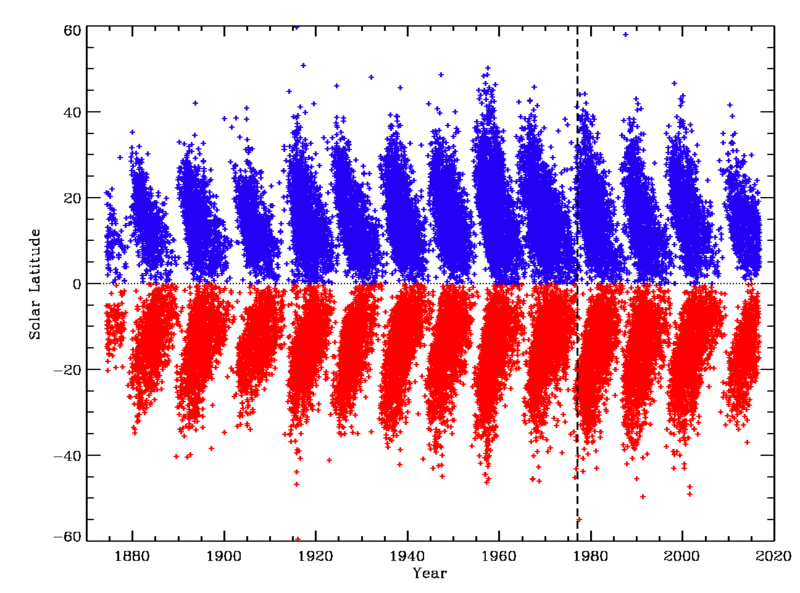 There is nothing special about solar maximum either (the two thick lines mark solar maximum for Solar Cycles 12 and 13.) Sunspots continue to appear closer to the equator until solar minimum. Then the cycle repeats. I used the RGO sunspot reports collated by David Hathaway to generate a modern butterfly diagram. The thick dashed line shows when RGO stopped taking data in 1976 and the US Air Force tool over. The data set continues until 2016 when Hathaway retired. 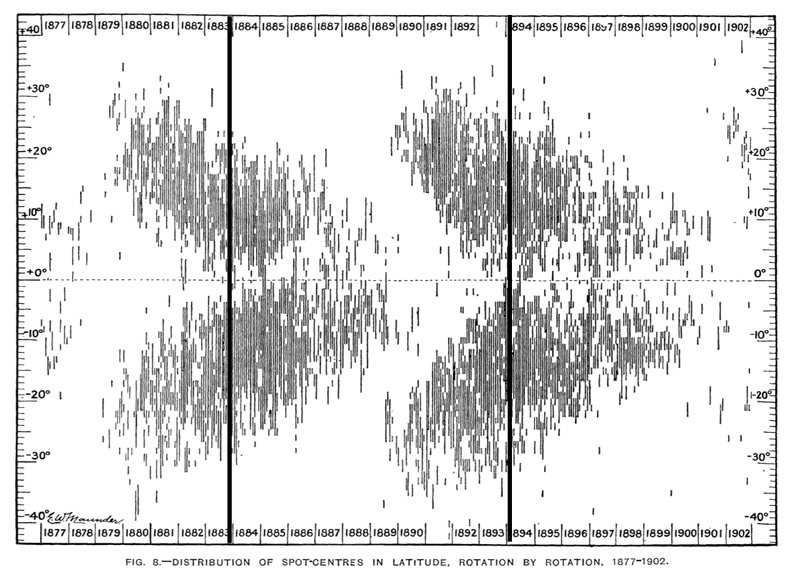 Each sunspot cycle is a little different, but they all share the high latitude to low latitude progression. We still use the butterfly diagram to study the Sun. Any paper studying the solar dynamo will probably include one just to show how well their model works. We also can use helioseismology to generate butterfly diagrams inside the Sun. These show that sunspot cycles start much earlier than sunspots can measure. My thanks and appreciation to Annie Maunder. Please go and use the AMAT at RGO soon! Today, June 21, 2018, at 1007 UTC (6:07 am ET) the Sun reached its northernmost point in our sky. In the northern hemisphere we have the longest day of the year while people in the southern hemisphere have their longest night. Six months from now we will reverse places for the Winter Solstice. It's all due to the tilt of the Earth's rotation axis that tilts us toward the Sun in northern summer. Our ancestors often celebrated the Solstices with parties. I'll celebrate with some pictures of the Sun. For those who thought Solar Cycle 24 had faded into history, please look at today's Sun. There are three active regions visible on the Sun and a sunspot number of 52. This blended image overlays an HMI magnetogram with an HMI continuum image. Helioviewer.org has provided pointers to the active regions. (The little β describes the complexity of the active region.) 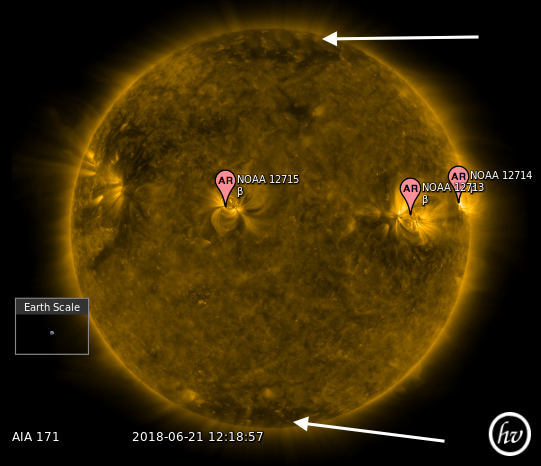 All three regions are at low latitudes in the northern hemisphere of the Sun and have the black magnetic field leading the white, so they are Solar Cycle 24 sunspots. Another region of Solar Cycle 24 field is visible on the left and will soon rotate into view. Even as Solar Cycle 24 fades, we see the signs of the next cycle. Here is an AIA 171 Å image, also with the active regions pointed out. I added two arrows to the dark patches at the poles of the Sun. Those polar coronal holes contain the seeds of Solar Cycle 25. The strength of the polar magnetic field says that Solar Cycle 25 will be a little more active than Solar Cycle 24. We only have to wait until 2025 to find out. Thanks to Helioviewer.org for the labels. The EVE team from LASP launched their calibration instrument over White Sands today at 1 pm MT (3 pm ET). They got about 10 minutes of data and the payload was parachuting to the ground. 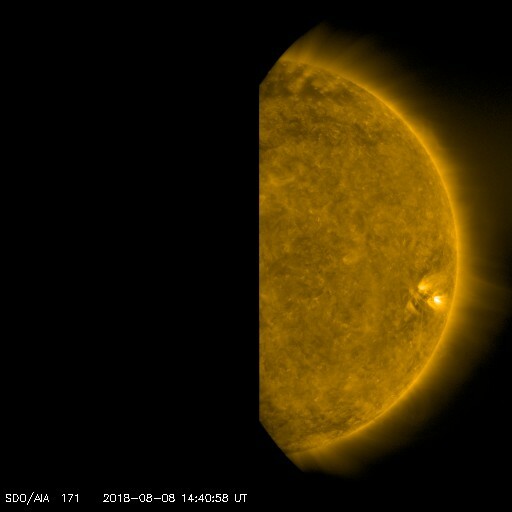 SDO completed the Failed High-Gain Antenna Simulation and rolled back to its normal orientation at 1900 UTC (3:00 p.m. ET) last Wednesday. Here is a short video using the Where's SDO? images showing that day in the life of SDO. Watch the Z-axis for the flip. Many thanks to the FOT and instrument team member who planned and executed this test. We learned a lot! This past Wednesday starting at 1415 UTC (10:15 am ET) SDO performed the EVE FOV and HMI/AIA Flatfield instrument calibration maneuvers. The spacecraft rolled back to its normal orientation before the test. Once the maneuvers were complete, SDO rolled 180° to continue our simulation test. As always during a calibration maneuver, the AIA images may be streaky or cutoff at the edges of the CCDs. The movie shows how that day looked in the AIA 211 Å channel. The interference caused by the edges of the CCD are easily visible around 2000 UTC. Next week SDO will perform the EVE cruciform maneuver on Wednesday, April 18, starting at 1430 UTC (10:30 am ET). Once again, SDO will roll to normal pointing before the test and roll 180° after the test. 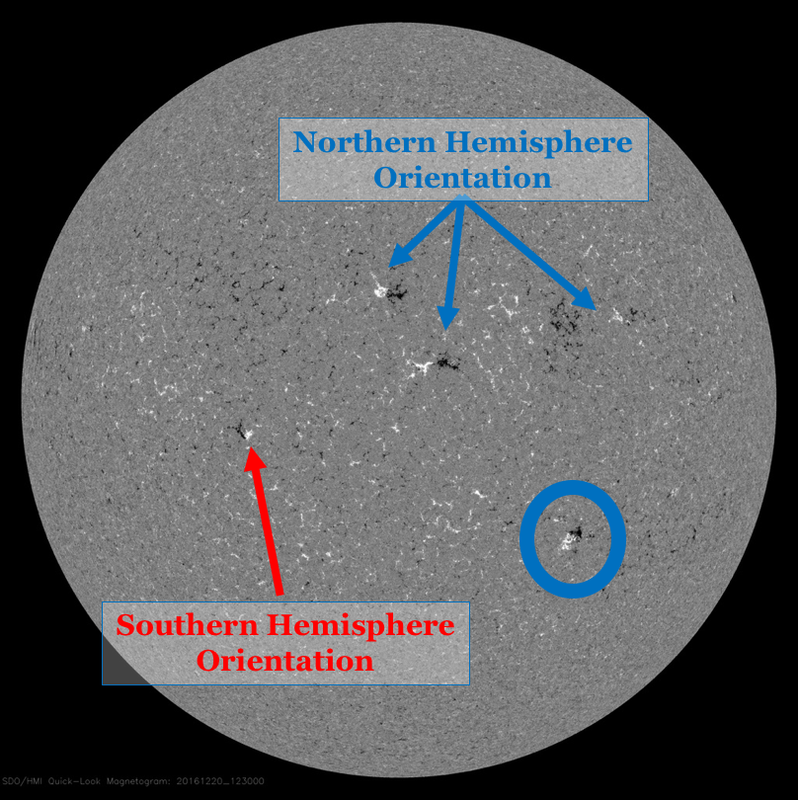 On 20-Dec-2016 a USET observer saw a small patch of magnetic field in the southern hemisphere of the Sun. The outward magnetic field (white in the magnetograms) was behind the inward field (black patches). This patch is circled in blue in the HMI magnetogram. This high-latitude region (23°S) did not follow the pattern of magnetic field seen in Solar Cycle 24. George Hale noticed that sunspots tended to have a definite pattern of their magnetic field. One hemisphere has the patch of inward field leading the outward. The other hemisphere has the opposite pattern. During the next sunspot cycle the hemispheres reverse patterns. 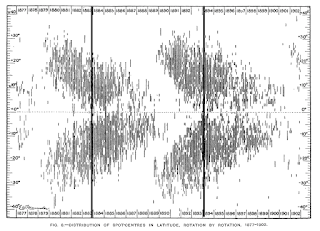 The arrows in the magnetogram point to magnetic fields that follow Hale’s law for Solar Cycle 24. The blue arrows point to areas that show the pattern for the northern hemisphere and the single red arrow the southern. Even the broad areas of magnetic field in the northern hemisphere follow this pattern. The magnetic field in the patch of magnetic field in the blue circle has the black leading the white — a sign that it is related to Solar Cycle 25, especially because it is at higher latitudes than most of the sunspots seen around this time. This is another pattern in sunspots. They tend to appear at higher latitudes early in a cycle and appear at ever-lower latitudes as the cycle progresses. 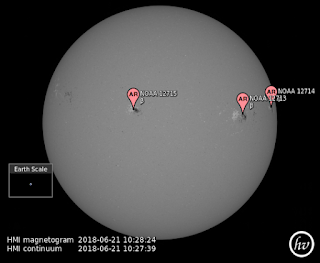 So, this little patch of magnetic field has two reasons to be the “First Sunspot of Solar Cycle 25.” It only needs to be seen as a sunspot and assigned an Active Region number. The first observer notified other members of USET and one of them went and looked at the Sun. There was a small sunspot where the patch of magnetic field was seen. It was assigned the number AR 12620. It is the small black dot above the label in the orange HMI continuum image. Only one of the four other patches of magnetic field in the magnetogram was also visible as a sunspot (AR 12619). Looks like we have a winner! Why mention this now? Because Sam Freeland saw another high-latitude (31°S), reversed-polarity patch of magnetic field in the southern hemisphere on 8-Apr-2018 (top panel of picture, the brightest area is the corona above the magnetic patch in an AIA 193 Å collage). This time the patch appeared and faded without forming a sunspot and did not receive an active region number. But Freeland saw a small flare at 12:57 UTC on 9-Apr-2018. This A2.5 flare may also be visible as a small blip in the GOES 14 X-ray flux (bottom panel, arrow points at blip). 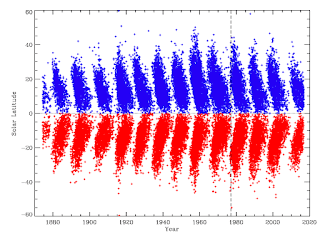 Each Solar Cycle overlaps with the ones before and after. We study this overlap in our quest to understand the solar magnetic field and the dynamo that creates it. Our modern data, especially the full-disk magnetograms, makes looking for these overlapping regions a little easier. As solar minimum draws near, we will see fewer sunspots but more and more of them will have the properties that put them into Solar Cycle 25. Eventually, solar minimum will be reached and after that sunspots associated with Solar Cycle 25 will become the majority. That should happen in 2020. It is good to see that solar activity will continue to fascinate us in Solar Cycle 25. The SDO Team continues running the high-gain antenna (HGA) test. 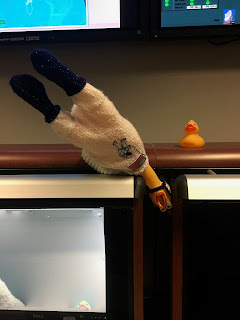 We are pretending that the “bottom” HGA has stopped working and we are running the spacecraft upside down to stay in contact with the ground. There has been no problem with the HGAs, but we need to keep the SDO Team thinking how to handle these problems before they happen. As you can see in the picture, the FOT is using Camilla as a reminder what roll angle SDO is at. Currently at 153.7°, tomorrow SDO will roll to 180°. The test will end on April 25 at 1900 UTC (3 pm ET). As the test progresses, the software to correct the orientation of the near-realtime images continues to be improved. By the end of the test all of the images will be correct! SDO uses two high-gain antennas (HGAs) on the spacecraft to maintain continuous contact with the SDO ground station in New Mexico. Should one of those antennas fail we would have to roll the spacecraft to a variety of position angles during the year to keep the remaining HGA in contact with the ground station. The SDO Team will be testing the procedures needed to run SDO on a single HGA from March 28, 2018, to April 25, 2018. During the test the roll angle of SDO will vary from 0 to 180 degrees. Near-realtime images from SDO may appear with the incorrect position angle, similar to what happens during an instrument calibration. To ensure you have correctly aligned science data, please use the exported images from the JSOC or the SSW IDL routines aia_prep.pro and hmi_prep.pro. If you use other software for data analysis, make sure you properly account for the value of the CROT2 when preparing the data. Remember: This is only a Test!" 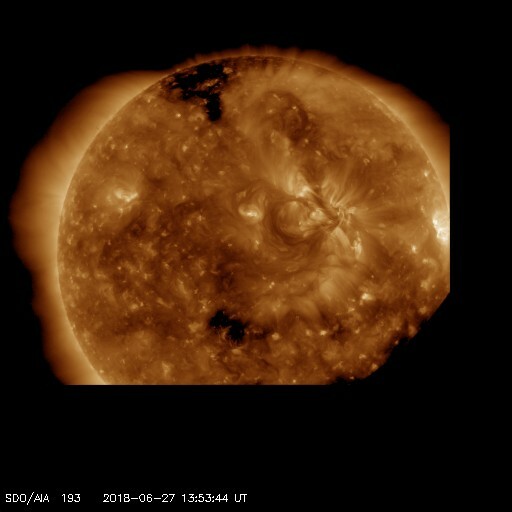 Although there isn't a major geomagnetic storm happening today (and none expected tomorrow), here is a lovely picture of the Sun showing a coronal hole. The high-speed plasma streaming out of this coronal hole will probably hit the Earth and create some lovely aurora, but a geomagnetic storm is not expected. SDO will perform station-keeping maneuver #16 today. The maneuver begins at 22:12 UTC (5:12 pm ET) and lasts until 22:56 UTC (5:56 pm ET). During the maneuver science data may be blurry or unavailable. Station-keeping maneuvers are performed to keep SDO inside of its box in the geostationary belt. Even though SDO’s orbit is inclined 28° to the equator (where geostationary satellites orbit), we pass through the geostationary belt twice each day. We must stay inside our longitude box to avoid interfering with our neighbors. SK maneuvers happen about twice each year. It was a cold day at Cape Kennedy as SDO rose slowly into the sky. Eight years later, SDO has sent over 260 million images of the Sun to the ground. Over 3000 scientific papers have described how the Sun's magnetic field is created and destroyed. We have a large number of citizen scientists who study our images, especially using HelioViewer. SDO still produces high quality data of the Sun every day. Even Solar Cycle 24 fades from view, we are watching the polar region magnetic fields grow. 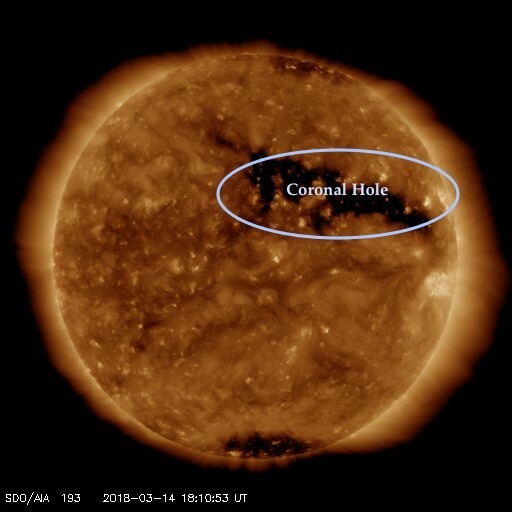 Large coronal holes can often be seen in the AIA coronal images. Solar Cycle 25 will soon be visible. SDO is ready! SDO ran a number of maneuvers during January 2018. Science data may be unavailable or blurry on days when a maneuver is run. During eclipse season the Earth blocks the Sun for up to 72 minutes each day around 0700 UTC (2:00 am ET). This is also midnight Mountain Time, the timezone of the SDO ground station. 01/03/18: RWA Jitter Test Successful: Instruments reported no blurring in images; ISS performance looked reasonable. Above is a movie in AIA 171 Å showing the effects of the EVE Cruciform on January 17, 2018. During the HMI Roll the Sun appears to rotate. 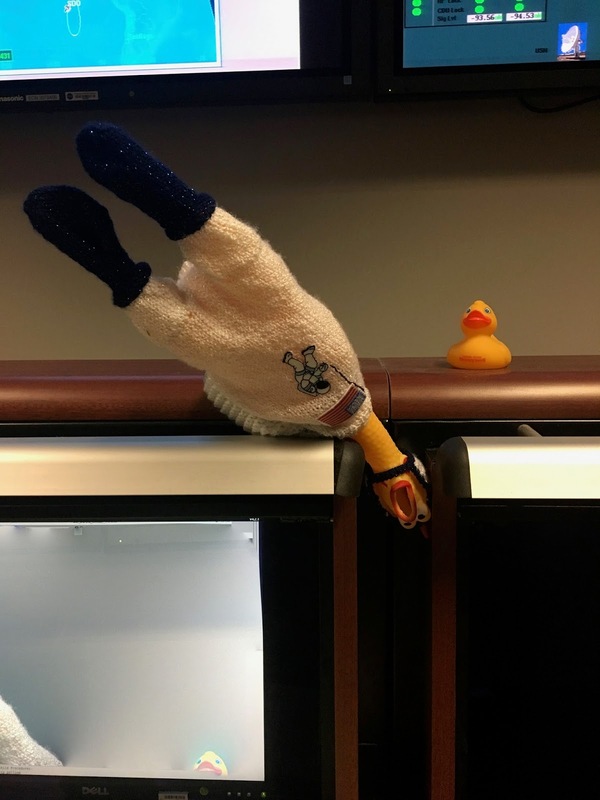 Today, January 11, 2018 at approx. 1:30 pm the SDO website will undergo server maintenance. The website will still be operational. However, images, movies, and data will not be available for some time.